truthjihad.com blog: FFWN: We're not locked up in Wal-Mart: Jim owes me lunch! FFWN: We're not locked up in Wal-Mart: Jim owes me lunch! The final story on today's False Flag Weekly News is an unusually important one. 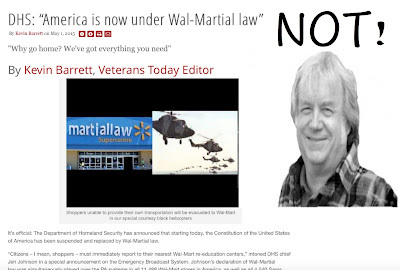 Co-host Jim Fetzer, who believed Jade Helm was a plot to impose Wal-martial law on the USA, promised last spring to buy me and my family lunch if we were not all locked up in Wal-Mart by mid-September. It's mid-September, Jim...and I'm getting hungry! World War III breaking out in Syria?